In a couple of years, my child will go to college. I want to save up some money for that time. I need to store that money in something that will preserve some value even after 5-10 years. Therefore I want to buy a small quantity of gold (for 400--500 Euros) each month and store them in a deposit box in a bank. What are effective ways to buy gold in Europe, especially Austria? I looked at GoldMoney.com because it was endorsed by Peter Schiff as the easiest way to buy gold. However, the amount of sensitive data they ask you to open an account is tremendous. They want to know everything about you, as if they were the Gestapo. I am not paranoid and have little concern with privacy, but even for me this was too much. The company seems to be located in Canada, hence European privacy regulations don't apply there. I also have little trust in their ability to maintain a complex software system because their web interface looks like it was designed 15-20 years ago. Maybe their backend is better, but who knows? There are also gold bars you can buy for about 450 Euros on Amazon, like this one. That's actually a viable option. I can find one-ounce gold coins in premium packaging at about 3% over spot. And I can find one-ounce gold bars in premium packaging at about 2% over spot. Guaranteed by the dealer but not in premium packaging can find one-ounce gold coins at about 2.5% over spot and one-ounce gold bars at about 1.5% over spot. Most holders of gold do not use safe deposit boxes but use bullion vaults run by major security companies. And most gold dealers can arrange storage in a bullion vaults. 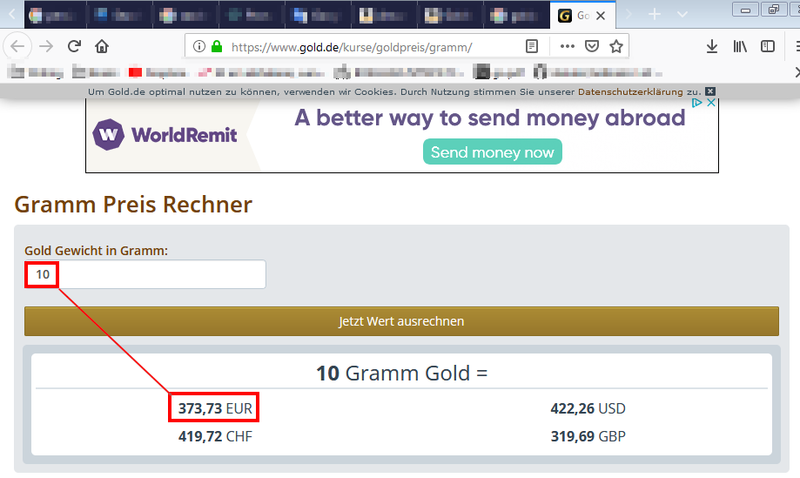 There is nothing wrong with the Goldmoney service. The advantage is that the unsegregated holding is less expensive to get into than a segregated holding. And their accounts represent gold held in bullion vaults. There are also gold ETF's on the stock market. I suppose that vaulting expenses combined with ETF expenses is slightly higher. A gold ETF could price at a premium or discount but would probably just follow the gold price. Not the answer you're looking for? Browse other questions tagged european-union gold or ask your own question. How is gold shared in worldwide economies? How to buy a Gold ETF in India?